National-Anarchist Movement: A callout to Bristol anarchists. Do we want a Bookfair in 2012? A callout to Bristol anarchists. Do we want a Bookfair in 2012? 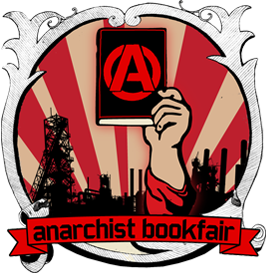 9 November: An anarchist assembly – do we want a bookfair in 2012? Wouldn’t you like to play a part in a successful anarchist collective that for the last 4 years has been organising an annual event that is both highly public and explicitly anarchist…and just keeps getting bigger? From 350 people in 2008 to around 1500 attendees in 2011, the Bristol Bookfair has rapidly become the UK’s second largest, and reflects the exciting anarchist movements in this city. Firstly to be an easily accessible, highly public event that provides an introduction to anarchist ideas, practices and local groups/projects via literature and meetings. Secondly to provide a space for anarchists in the region to gather, chat, plot & plan, exchange info, socialise, and get the latest anarchist books etc. So far we have made a huge effort to publicise the Bookfair very widely around Bristol and beyond, whilst chasing groups etc to get them to attend. We think overall the bookfairs have been successful in meeting the two aims. The Bristol anarchist bookfair collective is reforming, and holding an open meeting to discuss the viability of another bookfair in 2012. Nothing has been agreed or decided, and that includes who is going to be in the collective. What happens in 2012 will depend largely on what ideas, input and committment you can bring to the meeting. What is certain however is that the 4 to 6 people who have organised the bookfair each year so far, do not collectively have the available time nor energy to make it happen in 2012. This meeting therefore is for those who self-define as anarchists, whilst other radical comrades who have adopted a non-hierarchical, anti-capitalist and extra-parliamentary political position are welcome to attend. What do you think should happen in 2012? What format would you like to see? And where? Come along to the anarchist assembly! At 6.30pm for drinks & informal chat. Main assembly kicks off 7pm sharp! One last point is that the bookfair does not exist outside of the day to day reality. We are living through historic times. The political, economic and social upheaval around us is immense and fundamental change is on the agenda. Whatever we do we should be seeking to push any change in the direction of social revolution. Can, or does, the bookfair have a role to play in that? We obviously think it does!